In this wide-ranging volume, America’s most prolific science-writer takes a panoramic view of fringe science, technology, and the society of the future. Here is a fascinating collection of essays, ranging from the polemical to the persuasive, from the speculative to the realistic. The Roving Mind beings with a blistering attack on the latest and most controversial of the pseudosciences—creationism—followed by discussions of the Moral Majority and the social implications of censorship. Two dynamic sections in this book shed light on some important questions: How can society differentiate between real science and pseudoscience? How can we overcome technophobia? What are the social consequences of an advanced technological society? 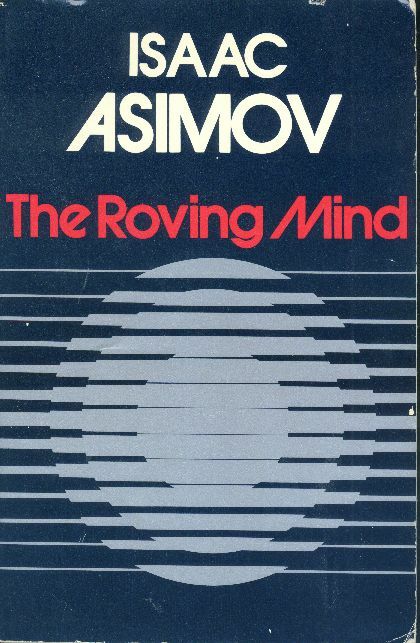 Asimov explores such topics as scientific speculation versus hypothesis and theory, scientific heretics, contact with extraterrestrial life, science fiction, telepathy, UFOs, art and science, and the population crisis. Another section focuses on the wonders of the cosmos, with specific chapters on Pluto, Jupiter, the sun, black holes, relativity, and hyperspace. Asimov concludes with several chapters devoted to his insightful speculations on the future. The essays in The Roving Mind have never before been published in book form; many are published here for the first time. Written in the delightfully clear prose for which Asimov is noted, this book should be required reading for Asimov fans and for all who are intrigued by the many facets of modern science. At some point in the early 1980’s, Doubleday seems to have tired of publishing collections of Asimov’s non-F&SF essays. As a result, other publishing companies took up the slack, among them Prometheus Books, which published three starting with The Roving Mind. Although this is, like many non-F&SF essay collections, a fairly miscellaneous lot of mixed style, there are a number of essays in it of particular interest. In particular, there are some very harsh denunciations of the conservative upswelling of the early 1980’s with the election of Ronald Reagan, whom Asimov loathed, and the rise of “scientific creationism,” which Asimov also loathed. The book also ends with the story of how Asimov acquired his first (and, to my knowledge, only) computer and the impact it had on him. Much of the rest of the materiel is the sort we’ve seen much of before in other collections, but the beginning and the end make up for that.